threads and stuff | is there any more pie? Posted on August 30, 2015	by is there any more pie? Last week I was driving to my physical therapy appointment (the frozen shoulder is thawing! Hurray!) and I missed the turn into the parking lot. I had to drive another half mile until I found a place to turn around. The possibilities are endless. The world of thread has changed since the old days of Coats & Clark. 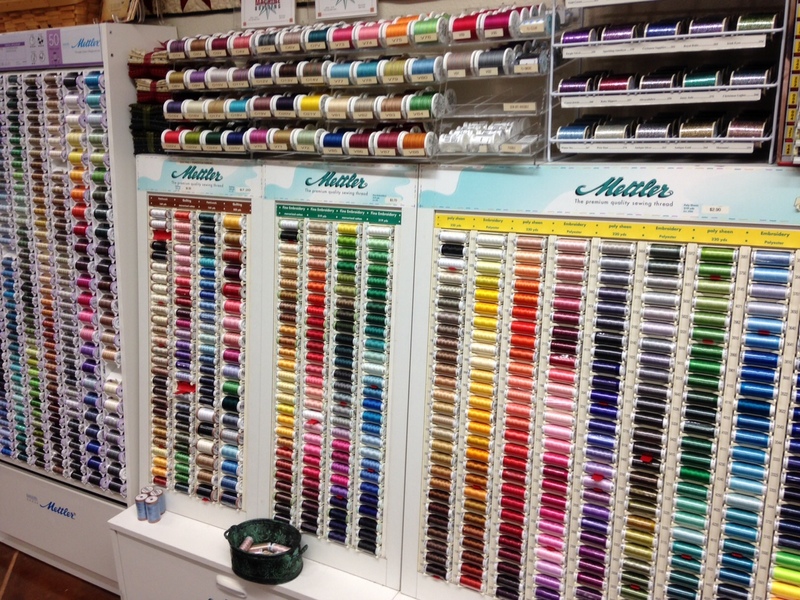 It is a huge business now, due to quilters being slightly obsessive about colors and content. There are silk threads, metallic threads, silk, cotton, polyester, along with variegated threads, too. There are super fine bobbin threads (my favorites), along with invisible threads and disappearing threads. So on Wednesday, when I should have been thinking about driving to my physical therapist’s office, I was instead thinking about thread colors and thread weights and bobbin threads for the latest quilt project. I just finished a complicated quilt top. It’s big and modern and so unlike what I usually sew. Thread colors matter. Stitching mistakes will be glaringly obvious. I actually created this top with solids, not the wild floral prints that always call out to me. Back home in Rhode Island I have more thread than I ever want anyone to see. One Christmas Banjo Man lost his mind in the local quilt shop and bought a jaw-dropping number of spools of variegated threads for me. I always liked those quilt-store Christmas gifts, but as of two weeks ago the women who owned that shop retired. There are no more local quilt stores now and I have no idea how far I will have to drive for supplies and thread and fabric. Where will Banjo Man shop now??? On the way to the airport to pick up Banjo Man, I stopped at the Gorgeous Huge Quilt Shop sixty five miles from here and shopped for thread. 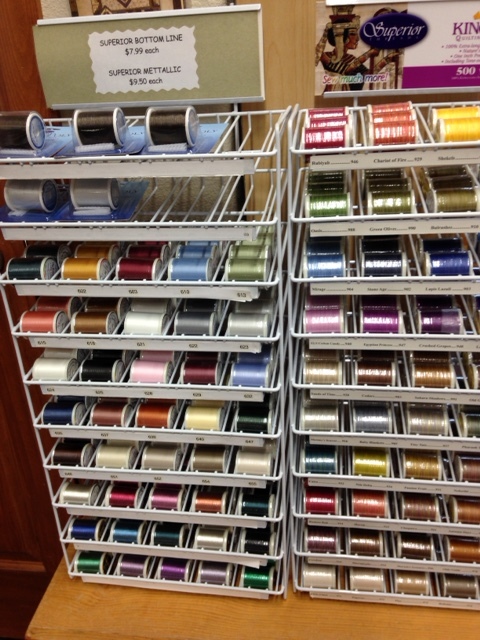 Threads at Bear Paw Quilts. So today, while it is raining (RAINING!!!!!!) I am going to play with thread. Samples have to be made, tensions adjusted, bobbins filled and threads tested. Banjo Man and I are happy to be together again. This entry was posted in a more pie opinion, family, just for fun, lake, quilting, shopping. Bookmark the permalink. Yay to rain. Yay dad made it safely. Love you guys!! I hope you bought enough thread to last a Rhode Island winter. It would make me happy just looking at all those colors.